The Gainesville Super Regional pitted two top-20 MLB Draft picks against each other but it was the 18th pick, not the top overall selection that came away victorious. 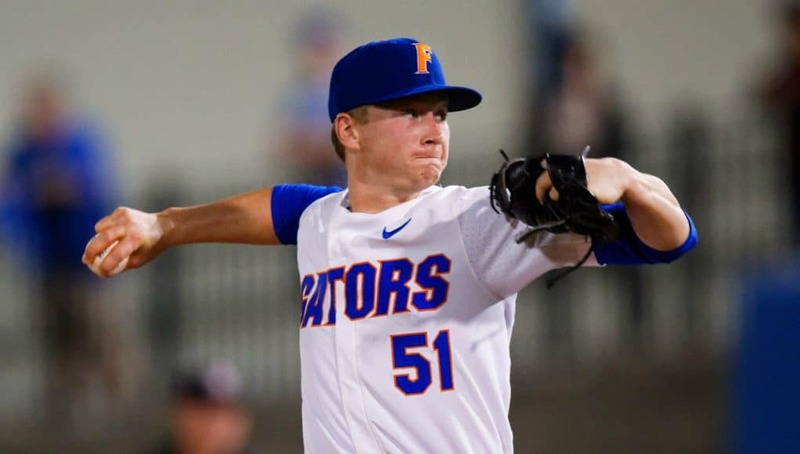 The Gators needed to come from behind but got the best of Casey Mize and the Auburn Tigers to the tune of an 8-2 win on Saturday afternoon. The way Singer threw the next two innings it looked as if the hamstring was bothering him more than he was letting on. Singer walked Edouard and hit Julian Estes to start the frame. Singer responded with back-to-back strikeouts but nine-hole hitter Josh Anthony, who was 9-14 with 7 RBI in the Raleigh Regional, singled through the left side to give Auburn a lead. The Tigers added another run in the third inning after another lead off walk. Florida’s offense finally go going in the third with Deacon Liput’s one-out single. Nelson Maldonado followed suit and Mize, who had just 12 walks all season before a career high five Saturday, walked India on four straight pitches. Wil Dalton came up with the bases loaded. He went the other way missing a grand slam by a foot but plated two runs to tie the game. It wouldn’t stay tied for long. Austin Langworthy dribbled a ball down the first base line that Josh Anthony tracked down. The ball looked like it may roll into foul territory but Anthony was transfixed on India who was racing towards home. Anthony scooped the ball and threw in the same motion but India was able to dive head first into home to beat the tag and give Florida a lead it wouldn’t relinquish. Keenan Bell added another run with a single of his own, tallying four runs on four hits for Florida in the third. Singer settled in retiring 9 of the next 10 batters he faced. He worked quick innings to get his pitch count under control, something Florida needed desperately. Singer came back out to the mound in the seventh inning. He gave up an infield single before a fielder’s choice and a fly out left him at 118 pitches. Kevin O’Sullivan started towards the mound, ignoring Singer’s motion trying to wave his manager back into the dugout. 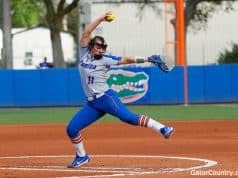 Singer received a standing ovation as the left the mound at McKethan stadium for the last time as a Gator. The Gators added two more runs in the fifth and a pair of solo home runs from Maldonado and Liput extended the lead to 8-2. Jordan Butler and Michael Byrne finished the last seven outs off for the Gators, who are one win away from going back to Omaha for the fourth consecutive season. 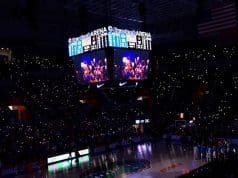 Auburn would need to beat Florida twice in a row at home to stave off elimination. 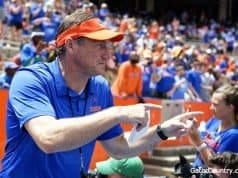 That’s a tall task, as the Gators haven’t lost back-to-back games at home since April 7th and 8th in 2017 (Tennessee). Jackson Kowar will take the mound for the Gators and Tanner Burns will toe the rubber for Auburn at noon.